Are you planning to travel for the holidays? 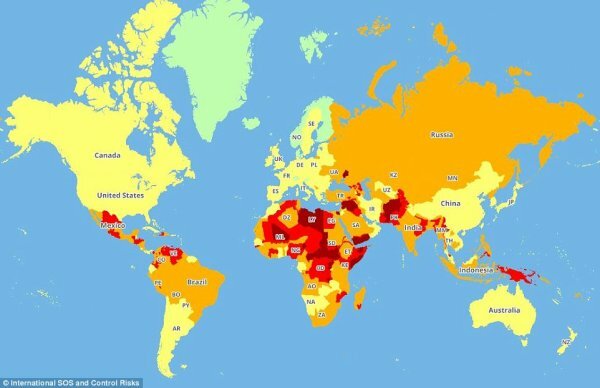 If so, you may want to reassess the intended destination, for 2018’s ‘Travel Risk Map’ reveals which countries are the most dangerous — and which are the safest — to visit. It turns out, most of Africa is “very dangerous” in terms of road safety and security. The safest, on the other hand, are Finland, Norway, and Iceland. The Daily Mail reports that the countries in the “low” category for health risks include Canada, most of Europe, the U.S., Australia, New Zealand and Japan. Countries you may want to look out for — as they were deemed to have “rapidly developing variable risk” when it comes to health — are Brazil, China, and Russia. 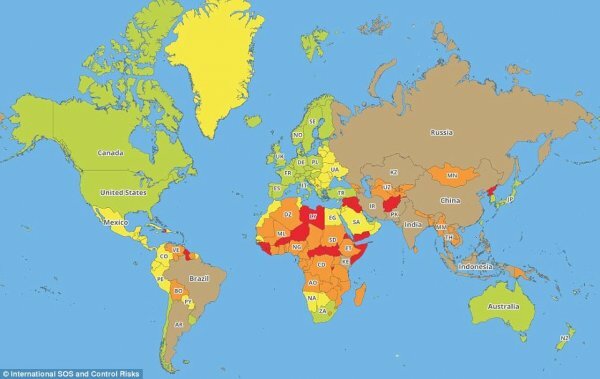 Nations that were ranked “extreme” in safety include Syria, Mali, Libya, South Sudan, Afghanistan, Somalia and Yemen. Mexico, Pakistan and parts of India scored “high.” After those nations in Africa, Brazil, Bolivia, Saudi Arabia, Iran and Kazakhstan also post great risk. The U.S. scored a “moderate” ranking in this category, interestingly. Now, there’s the bad news. The good news is, most of Europe is ranked “very low” or “low” — and so is Japan, Australia and New Zealand. Due to climate change, countries around the world may become increasingly dangerous to travel to. This is because global warming — another name for the same phenoemon — exacerbates disasters such as earthquakes, hurricanes, and storms and coupled with rising sea levels, may make some locations inhospitable. Based on a global survey by Ipsos More Business Resilience Trends Watch 2018, most people are aware of this. Two-thirds of people who participated in the survey (63 percent) believe travel risks have increased over the past year. The participants cited natural disasters and security threats as the two main reasons for changes in travel plans. The same survey also found that 58 percent of business travelers had changed their plans due to security threats. Close to half (43 percent) changed their travel plans because of natural disasters.
? Tesla Opens Largest U.S. Supercharger Stations To Date And That’s A Big Deal Animated Short Reveals The Dark Complexities Of Healing Our Broken Society ?